Pružinové trubky tyčky zdvihátka tlačné v zlatém eloxovaném hliníku (nastavitelná délka) set 8ks. Trubky lze aplikovat přímo na voze, bez vyjmutí motoru. Po demontáži vahadel a vyjmutí tyček, stačí odstranit staré trubky a nové opět nainstalovat. Jsou dodávány včetně těsnících kroužků. Spring adjustable push rod tubes set 8pcs. An outcome if you do not want to remove the engine from the car but do want replacement. 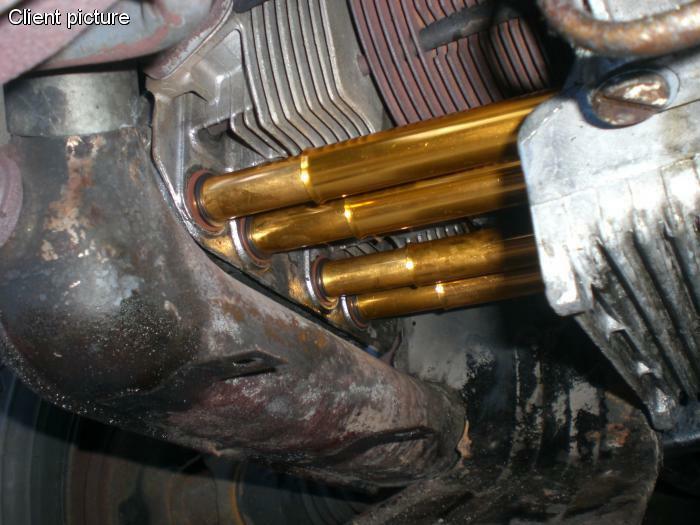 pushrod tubes Remove the klepdek fabrics and rocker shafts, pull the pushrods from the legs and pull through the bottom of the pipes between the crankcase and the cylinder heads. Now install the pushrod tubes by releasing it. Sliding in and between the crankcase and the cylinder head you now have again made ​​a leak-proof seal without motor from the au to pick the view is also significantly improved. The pipe jes are made ​​from gold anodized aluminum andadjustable spring are complete with gaskets per set of 8 pieces, or per piece delivered. The latter is controlled if there is only a leaking push rod tube must be replaced.